But what if you fancy a spot of sunshine but would rather be a bit more active? There’s nothing wrong with lounging by the pool for days, but it can get a bit – well, boring. How about a hike? Here are some suggestions to get you started; many hotel and resorts offer concierge staff that can help you find a guide if you like, or you can book one online before you go. 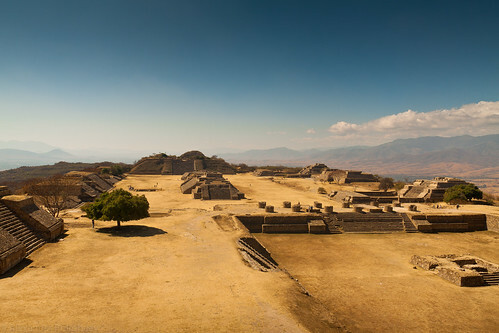 Monte Alban is an UNESCO World Heritage Site, the site of a Zapotec building that was raised some say as early as 400 B.C. The temple here is located on top of a plain that offers some spectacular views, not to mention the unusual sights here as well, such as the tombs and temples. You can enjoy Monte Alban in a simple daytrip from Oaxaca, which is just a few miles away. And local guides that give tours of the site are very good and offer historical commentary as well. There isn’t much walking to be done in Cancun – at least enjoyable walking, since all you do is pass resort after resort after resort. However, I tell everyone to catch a ferry over to Isla Mujeres, an island off the coast that while still popular with tourists, is by far much quieter and more relaxed. Most people step off the boat and hop into a golf cart to drive around, but you can actually spend the day walking around the island. I’ve done this and actually ended up catching a cab part of the time because we wound up lost, so don’t do what we did and instead plan in advance. The back side of the island (opposite of the ferry terminal) is more scenic, in my opinion). This one is for those of you a bit more serious for the climb, but did you know that the third largest mountain in North America is here in Mexico? Pico de Orizaba is the tallest mountain in Mexico, and it’s almost hard to believe its peak always has some snow and is often covered. The mountain face is very iconic because it looks like the volcano could re-erupt at any minute – though you’ll be waiting a bit, the last eruption was in the 19th century. As I mentioned, this is certainly one to do as a guided hike, and this isn’t an easy stroll – there are glaciers and other treacherous parts, and if you aren’t accustomed to the altitude you could get sick. Last but not least is to consider a trip into the Sierra Madre mountains from lovely seaside Puerto Vallarta. One of the things that makes Puerto Vallarta special is the jungle backdrop you get on the beach, and there are a lot of tour companies that offer excursions up into the mountains, each with varying levels of difficulty. The Sierra Madre mountain range goes for miles – a friend of mine hiked for nearly 8 days here. Rest assured, though, you can easily do hiking day trips. I should mention that “sierra madre” means “mother mountain range” in Mexican, thus there are three mountain ranges that are all called Sierra Madre. Confusing, I know. For any excursion – especially if you’re going to make it a long daytrip – I’d suggest you book your walk perhaps the second or third day of your trip; not too soon that you are tired, but it is a great way to blast away any jet lag. And you don’t want to do it too close to the end of your trip, as it’s nice to have some downtime and relax after a good walking excursion. And don’t forget water and sun block – the Mexican heat and dry air can be relentless, and you don’t want to end up in hospital!